By buying this product you can collect up to 15 loyalty points. Your cart will total 15 loyalty points that can be converted into a voucher of £3,00. 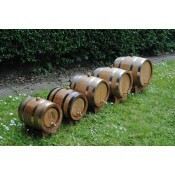 Oak for the long-term (and short) storage of wines, cognacs, liqueurs, whiskey. The perfect gift for anyone who likes alkohol. 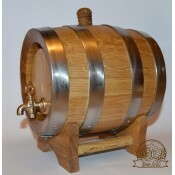 Barrels produced in our company are manufactured in accordance with the old eastern Europe art of cooperage. For the manufacture of barrels we use pedunculate and sessile oak, and the seal is made of sweet flag leaves obtained on appropriate time, which with the carefully selected oak give stored beverages a specific tat and aroma. Beverages stored in oak barrels are able to “breathe” which has a positive effect on the complex processes occurring in alcohols. In the course of aging aromatic esters are formed that give a distinctive flavor bouquet. WE HOPE THAT YOU WILL ACHIEVE GREAT SATSFACTION FROM OUR BARRELS, TASTING “STARKAS”, BEVERAGES, WINES, COGNACS PRODUCED AT HOME. THE BARRELS PURCHASED IN OUR COMPANY MAY BE YOUR PERFECT DÉCOR FOR THE DOMESTIC BACK-BARS, BASEMENTS, AS WELL AS RESTAURANTS AND HOTELS.